Published March 24, 2014 at 640 × 510 in Landscapes and Seascapes. La Roche de Saint-Pierre During the month of August, 1769, Father Charles-Francois Bailly de Messein visited Cape Sable in southern Nova Scotia. He was the first missionary to visit the Acadians after their return from exhile. He baptized and married many people who had not seen a priest for many years. Father Bailly landed at a point at the southeastern extremity of Comeau's Hill stretching toward the east. Even today, this is still known as "La Pointe a Monsier de Bailly" (Mr. Bailly's Point). Father Bailly, having come here by sea, stepped ashore and, a short distance from there, celebrated a mass in the shade of a huge rock known as "La Roche de Saint-Pierre (St. Peter's Rock). On the face of this rock is a cross. 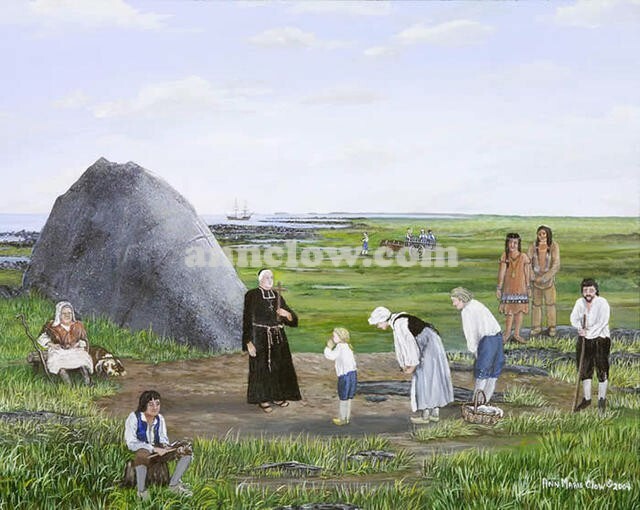 It is believed that both Acadians returning from exhile and Mi'Kmaq were present.